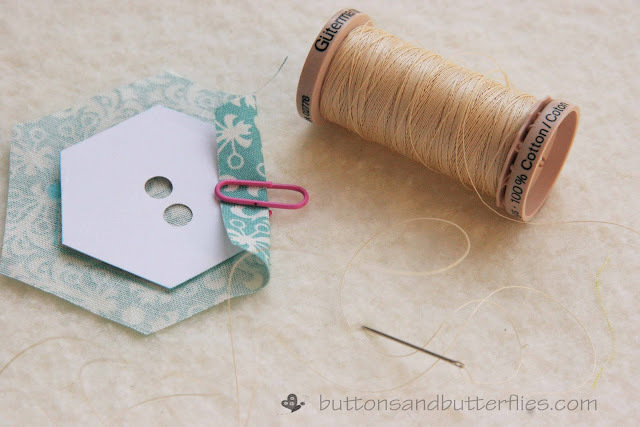 Note: This post was meant to be posted on November 17, 2012...but unfortunately, not only was the virtual sewing event cancelled for low participation, my post didn't upload correctly when I was ready to just share it at that time. I have an EPP project that will be posted tomorrow, so I thought this would be a good time to resurrect it from draft status. Hope it is helpful! 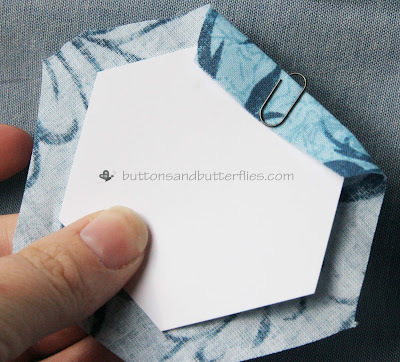 This tutorial is the basis of any paper pieced project. 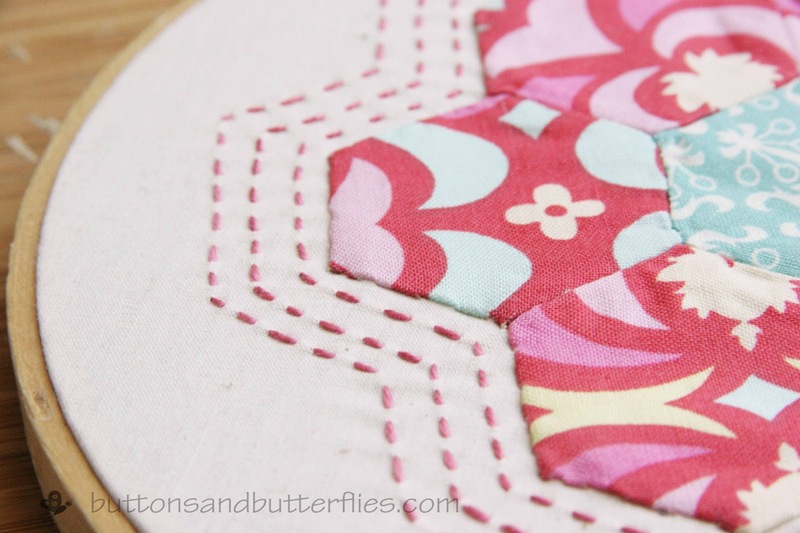 I want to be clear that this is MY favorite way to baste and stitch English Paper Piecing (EPP). 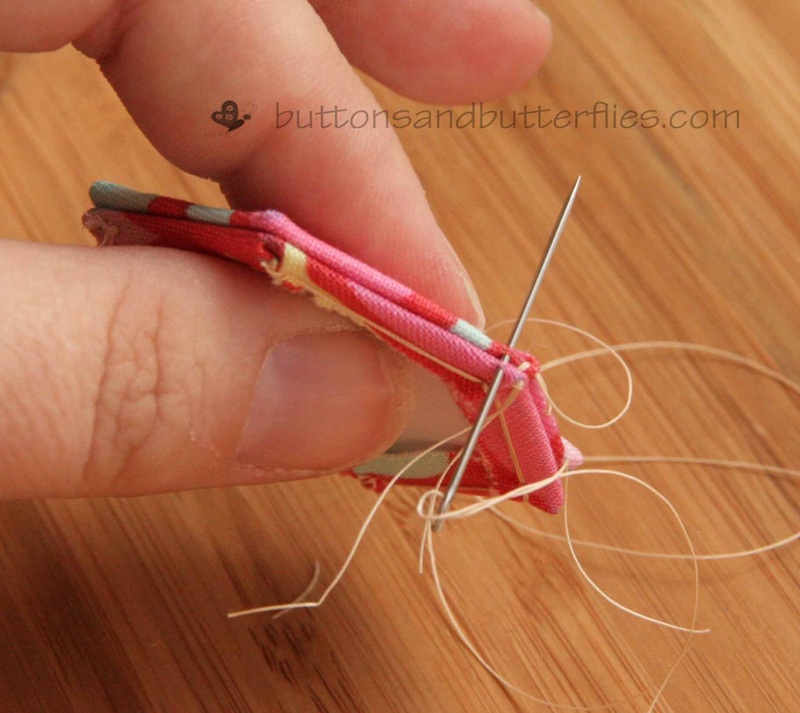 However, there are many more ways to baste and stitch your pieces together! 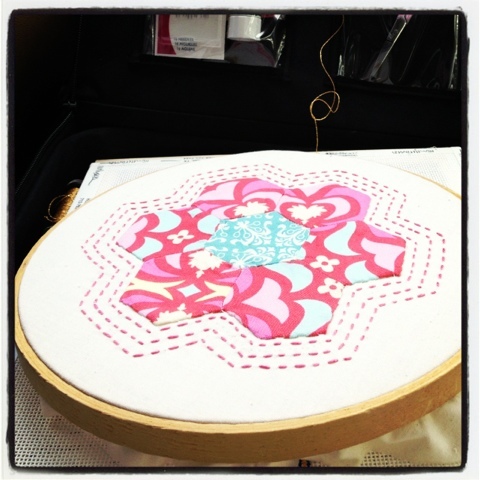 I had to show you a quick decorative hoop project! Print the .pdf HERE on card stock. 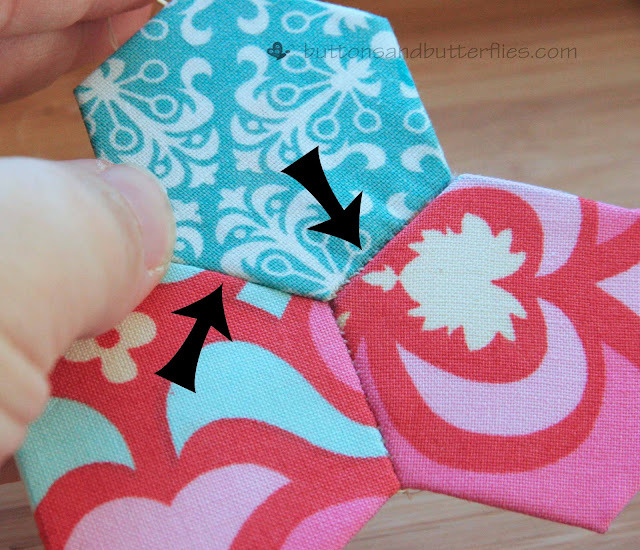 IMPORTANT: For all English Paper piecing (EPP). When a pattern states the size of a hexagon, the measurement is usually based on the side measurement, not the width or height of the entire hexagon. 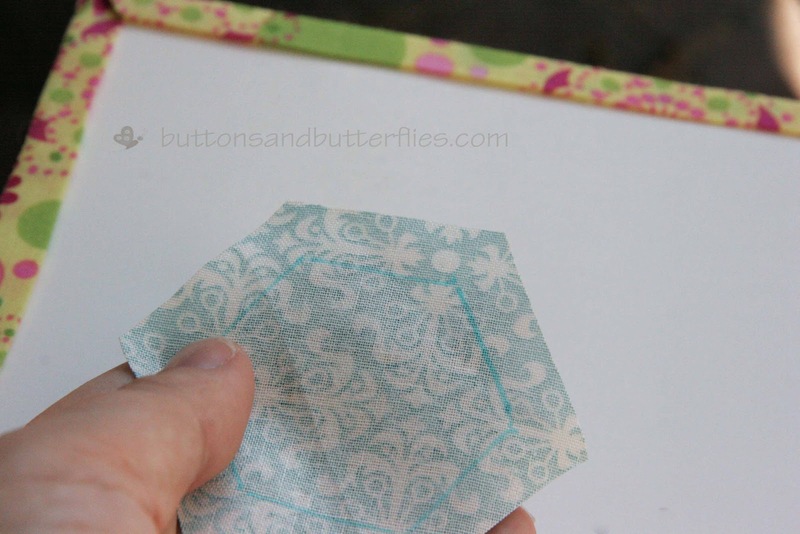 After you have printed cut the hexagon...steady hand. I try to cut it right on the inside of the line. The key is to make sure the method you choose to cut is consistent for each piece. 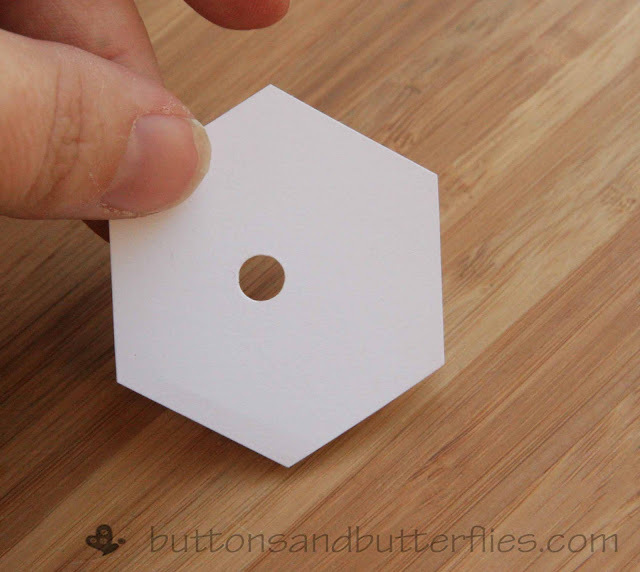 This is optional, but I find it helpful later to punch a hole in the hexagon...two if you plan to pin them. 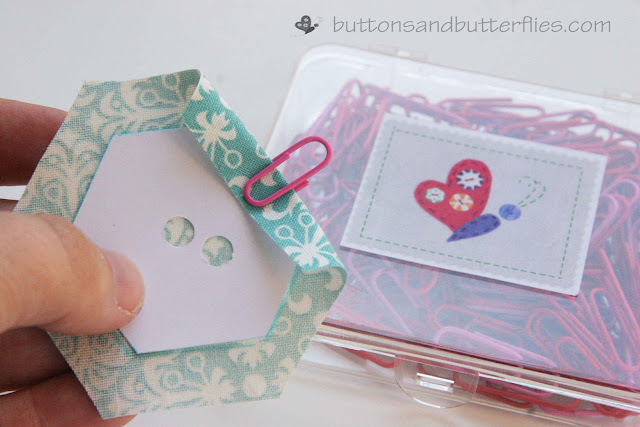 Grab your hole punch! *Note: If you are planning a large project, you can purchase plastic and cardboard templates in many stores and online. I even used my die cut machine to punch them out for a massive future project! Next, grab your fabric scraps. They can be random or you can have five in one print and one completely different! 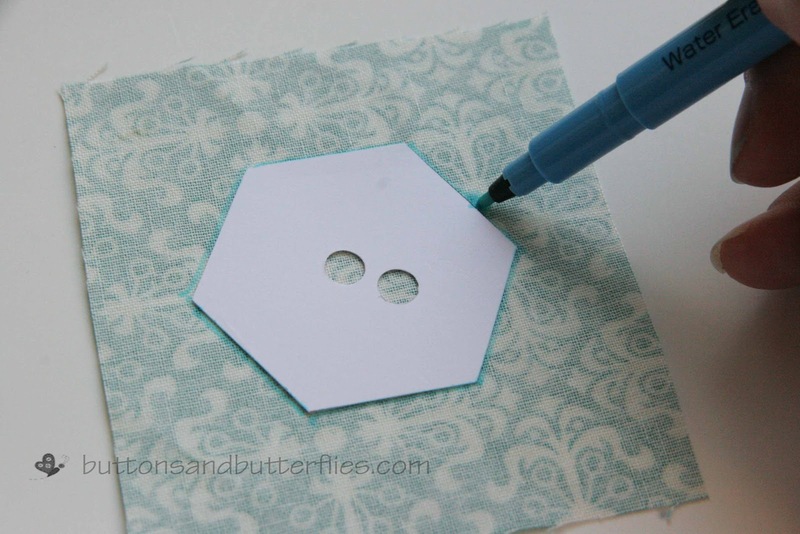 Grab your template and trace your hexagon. 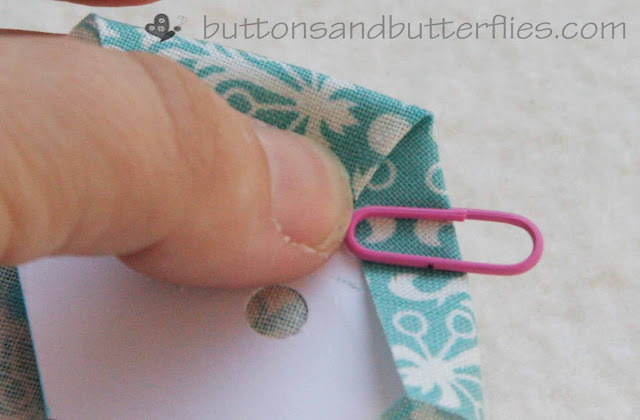 Trim your fabric scrap to a 1/4- 3/8 inch seam allowance or more. Can you rough cut them? Do you need more than just a few? 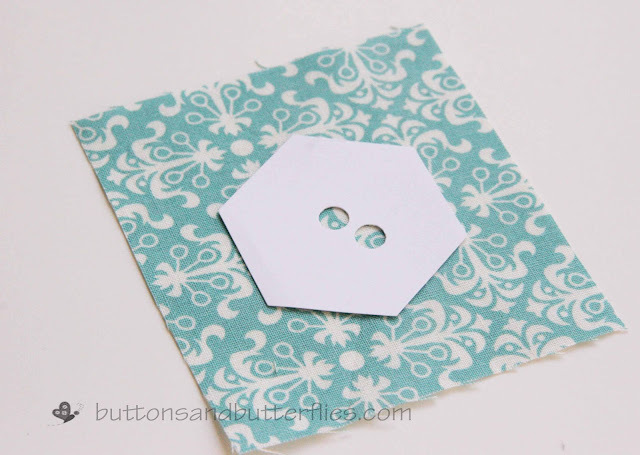 I explained HERE how I used my Sissix die cut machine with an Accuquilt die cut. I was able to cut 100+ in less than 20 minutes. 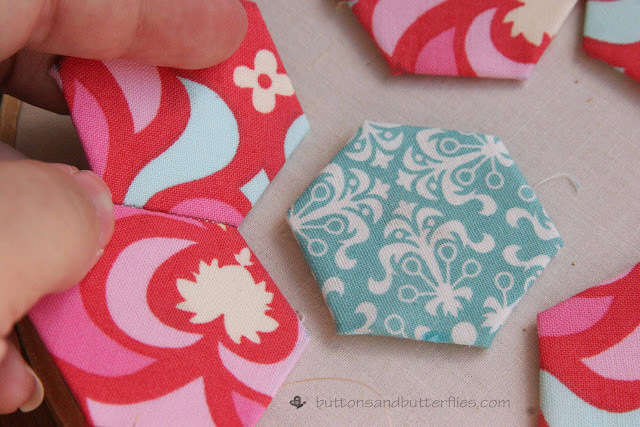 Another option is to purchase pre-cut fabric hexagons that are available online, at your LQS, and big store fronts like Joann fabrics. Even now Moda is carrying Honeycombs and I have seen a few Kona solids out there, too! Yup. 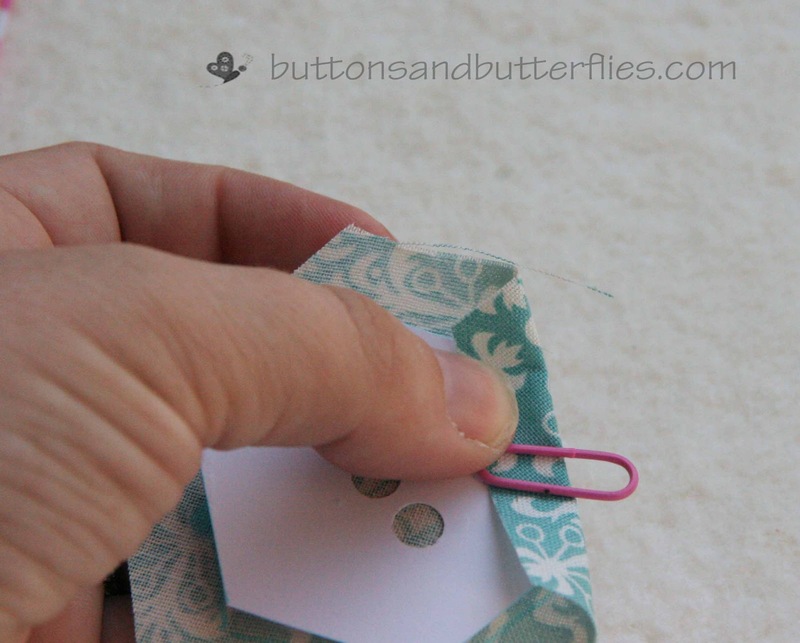 A paper clip! I actually found these cute colorful ones! and have also fallen in love with these teeny tiny ones I found in the scrapbook aisle. After you secure your template? You will get your needle and thread. 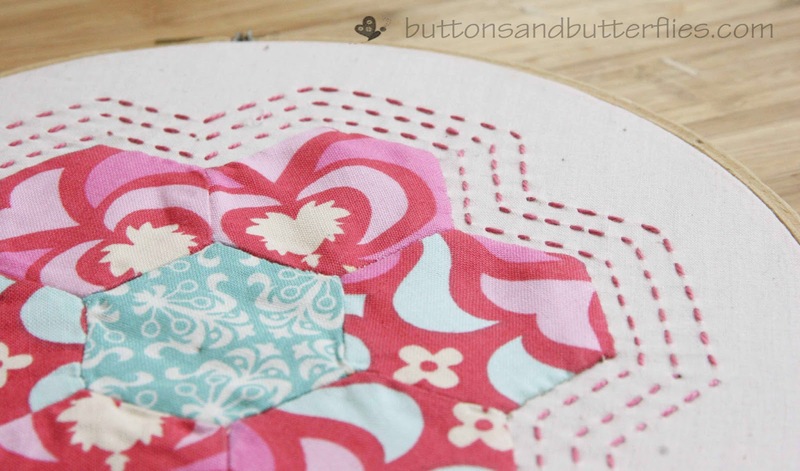 I am using a size 7 Quilter's Between needle and Gutermanns cotton here. I always keep my length to no more than 18 inches. 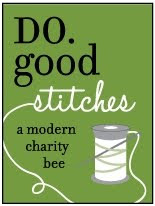 It is something I learned with all my needlework...more is not always better. 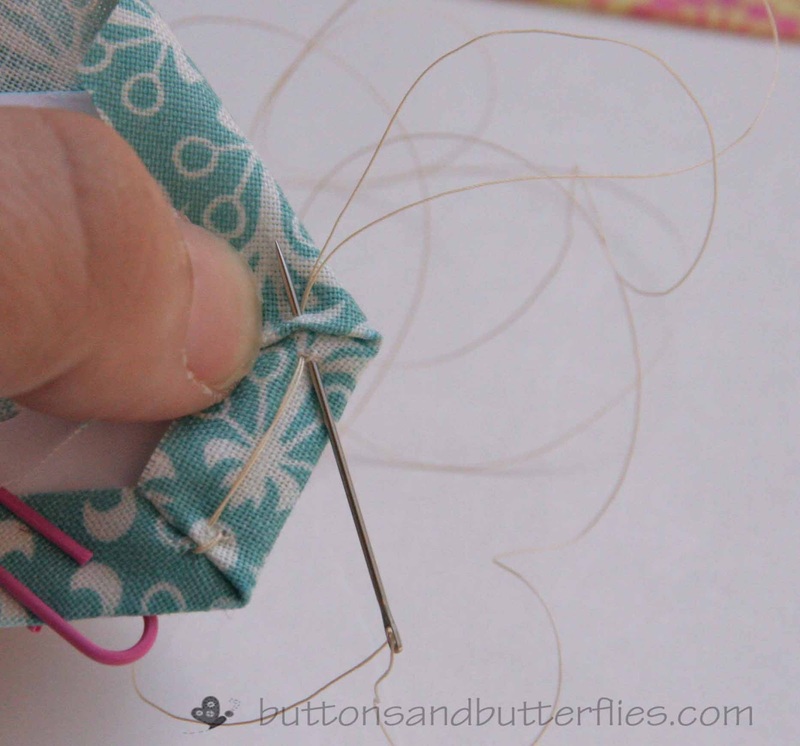 The thread can get very tangled! 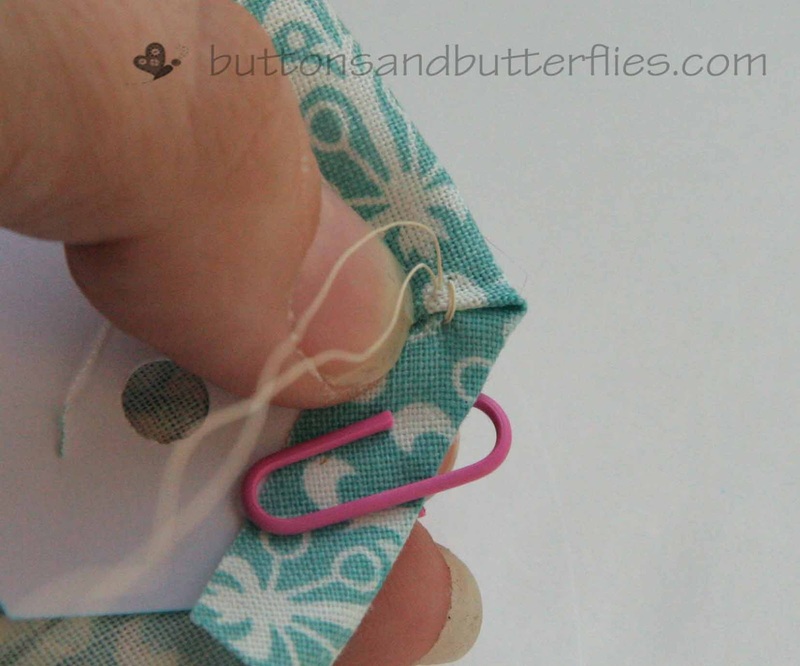 Once you have your knot, start to the left of your paperclip. 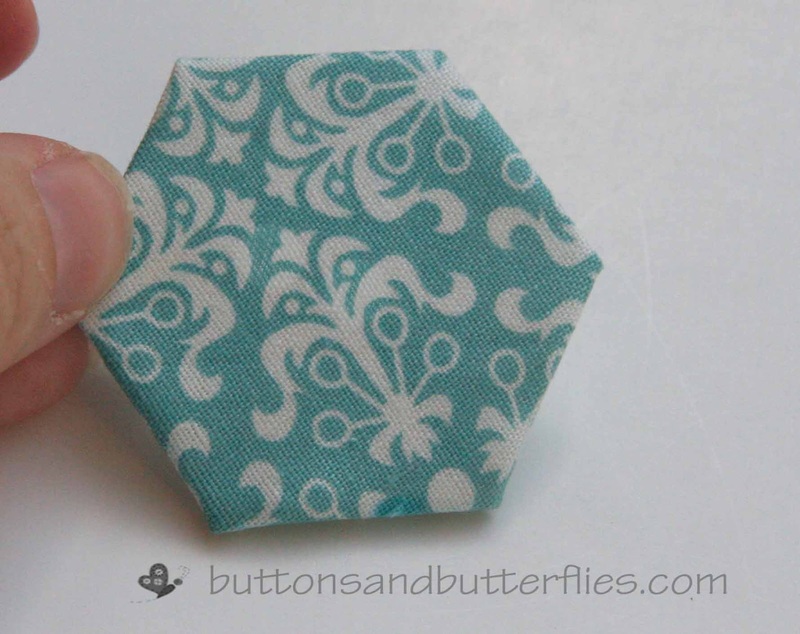 You will fold the first hexie side down. 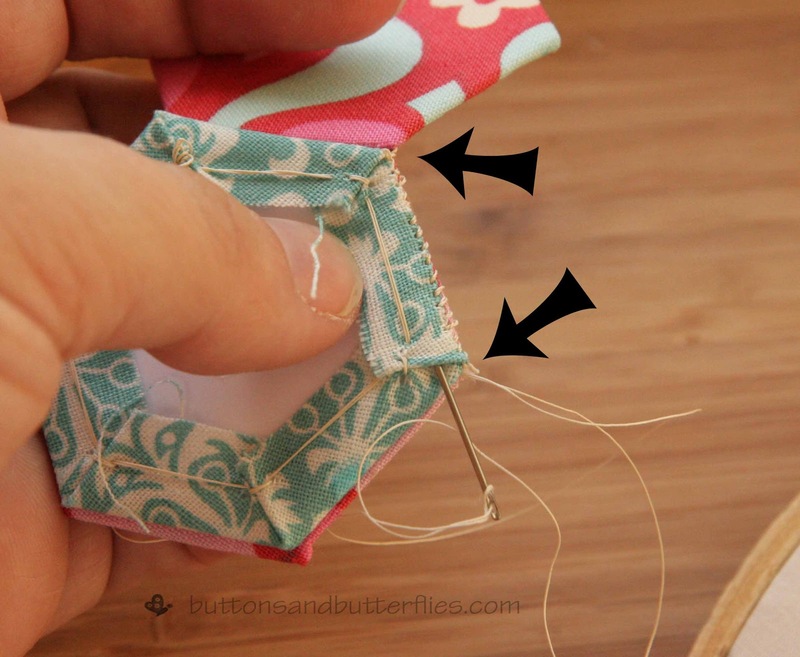 Grab a bit of the fabric with your needle. Travel to the next corner. Yes, it shows. But not a big deal. It will never get seen on the front! 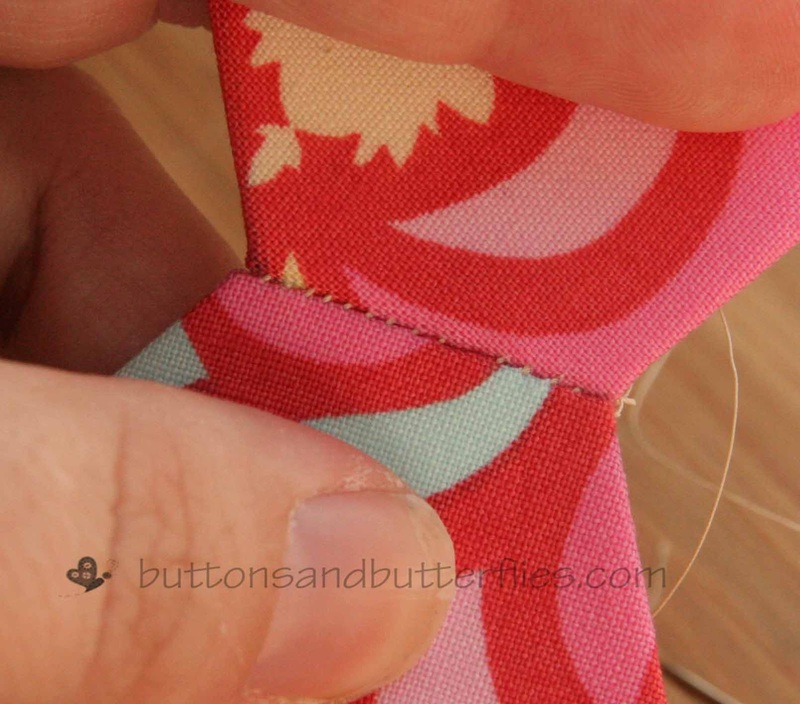 While you are doing this, keep pressure in the seam allowance. You want your fabric to be taut on the edge to get a nice crisp side edge! Then you will be at your last side which is also your beginning. 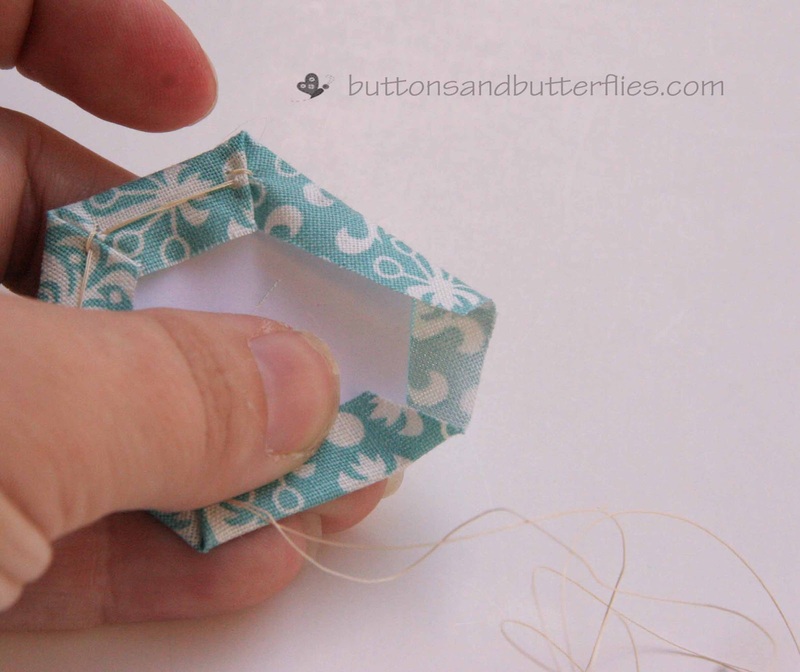 Secure your thread and knot. You will repeat this for five or more hexagons for THIS project. First, keep your templates inside your finished hexies...not time for then to come out yet! If you are doing this flower or any other design, I recommend laying them out just like you would do for any block in Quilting. For this project, I stretched a piece of scrap muslin on a 8" hoop. Like the layout? Grab the first two. Place them together with the right sides facing each other. 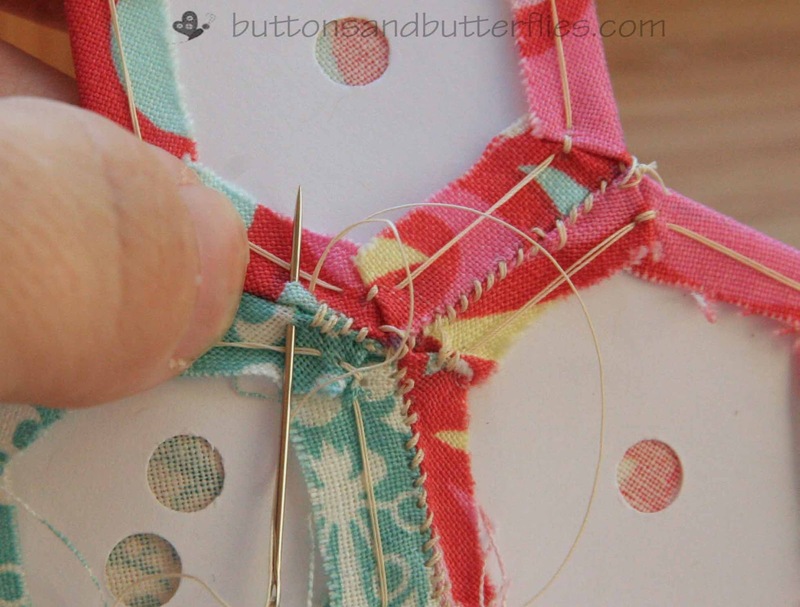 I start my first stitch in the crevice of a corner. Then move to the other side and grab the other corner. That way I am sure to have matching points/corners at the front. 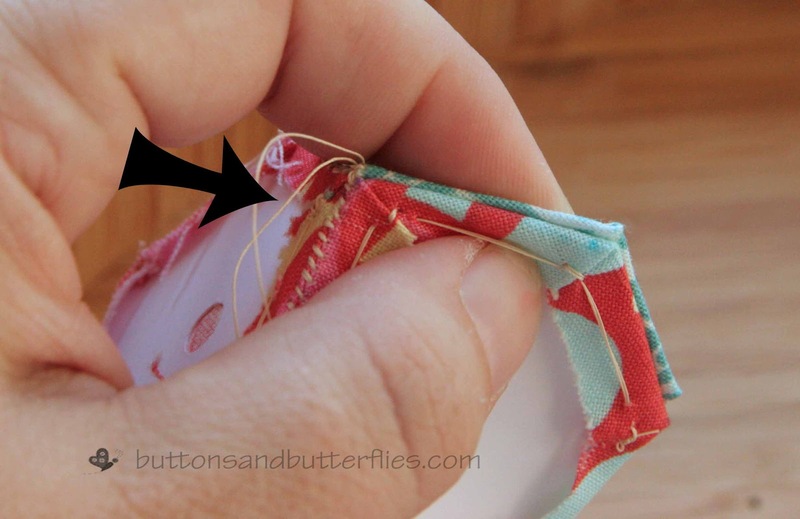 Then travel back and forth with a ladder or whip stitch. This does not have to be pretty!!! It will all be covered up. 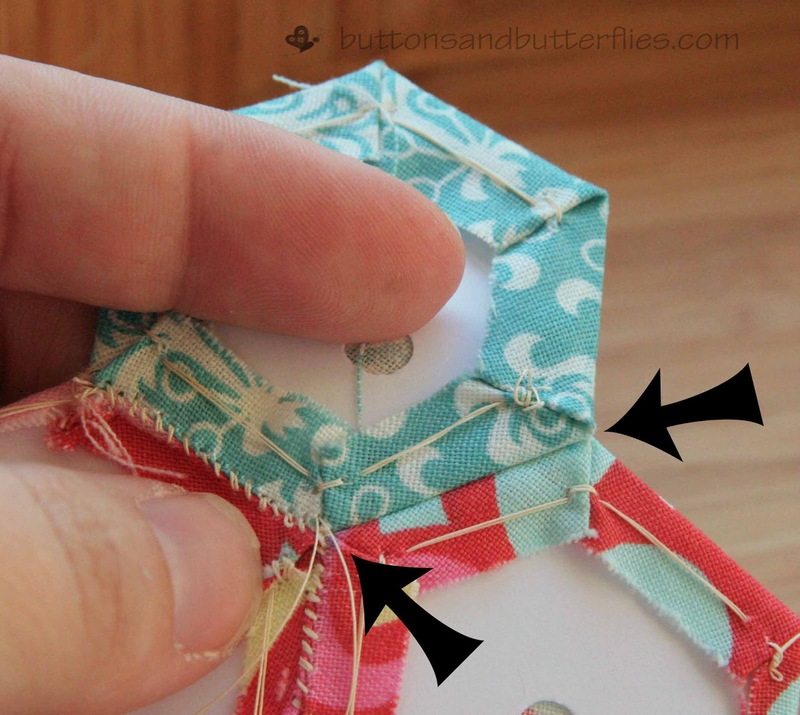 The point is to make sure your stitches are secure and snug! 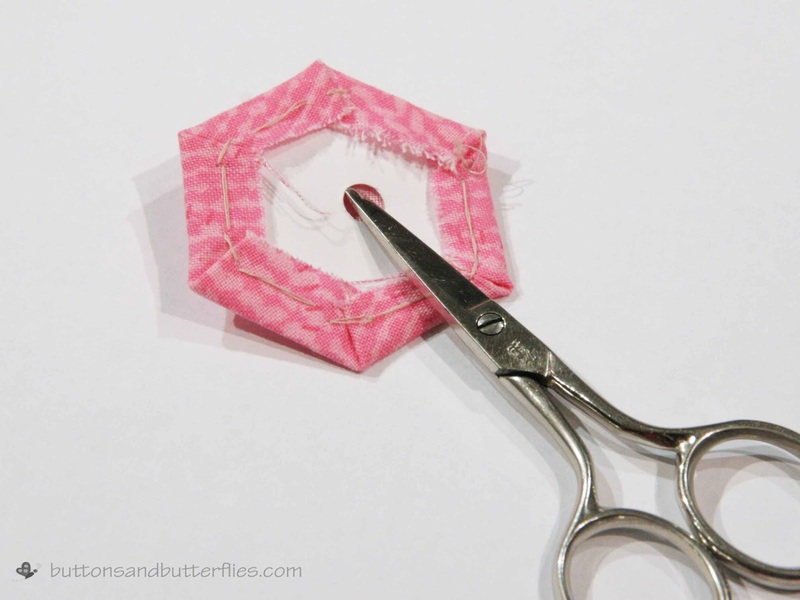 You can do your stitches close to the edge, but your stitches will show. If you grab lower like I do below. I feel that you can hide the stitches much better. 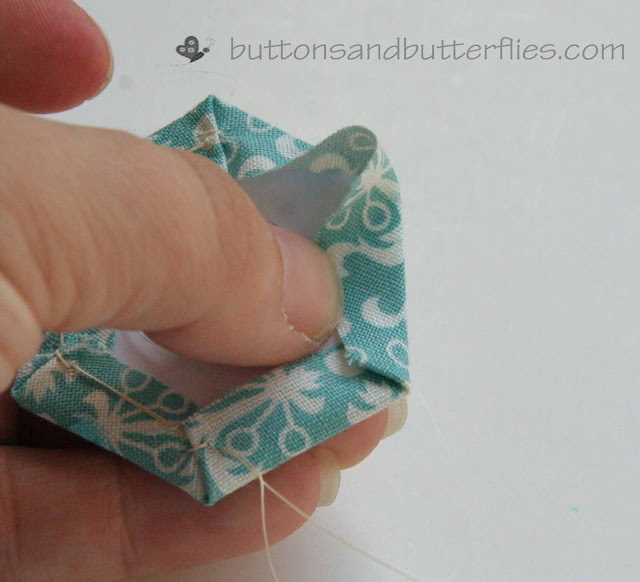 You may have to bend the previous hexagon (see arrow). 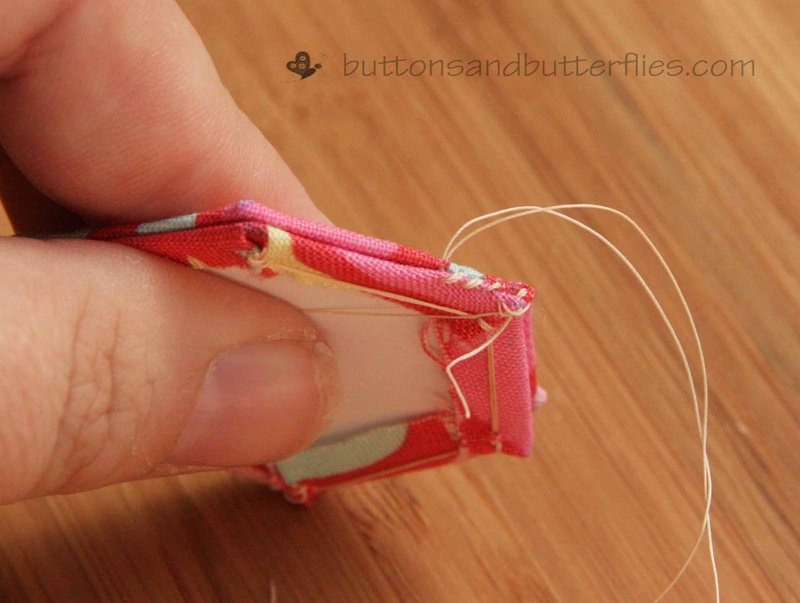 Whipstitch again. This part is my favorite. 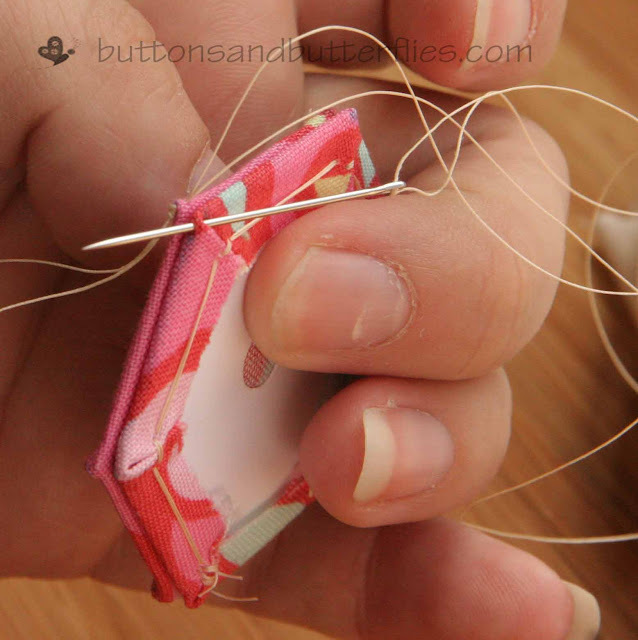 When you find that you need to move your needle and thread. Don't worry about knotting and trimming. Go under at bottom arrow and come up where the top arrow is. Completely hidden! Now move your way from the center arrow, out. 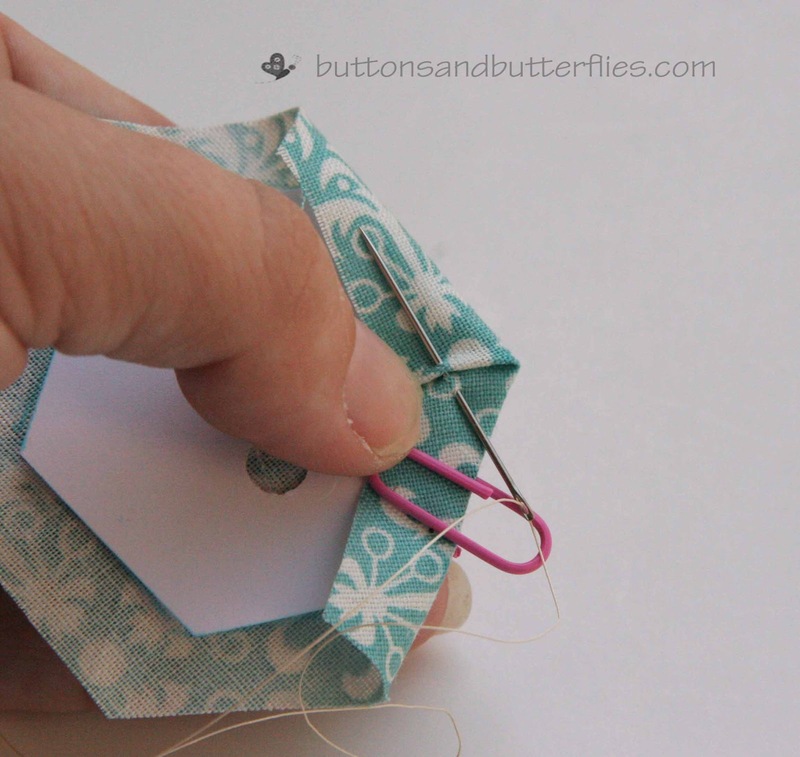 Continue whip-stitching and traveling until you have a flower! Time to pop out your templates. Remember the hole? Just slip the end of your snips in the hole, or grab your seam ripper and pop those puppies out! No worries! Slide the ends of your snips under a flap and wiggle that template out! 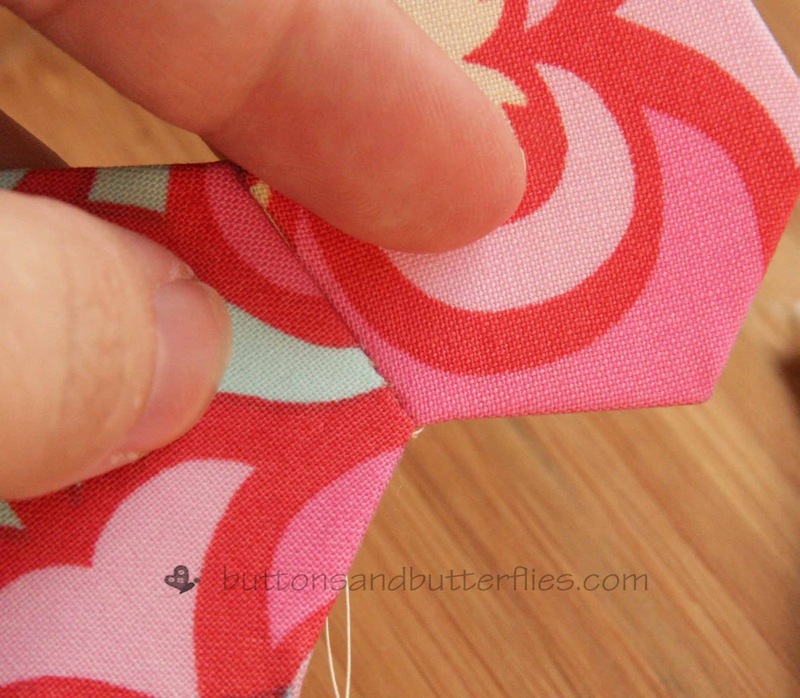 You could machine applique or needle turn appliqué at this point. It is pretty with just the hexagons, but you why stop there? Grab your embroidery floss and do outlines. 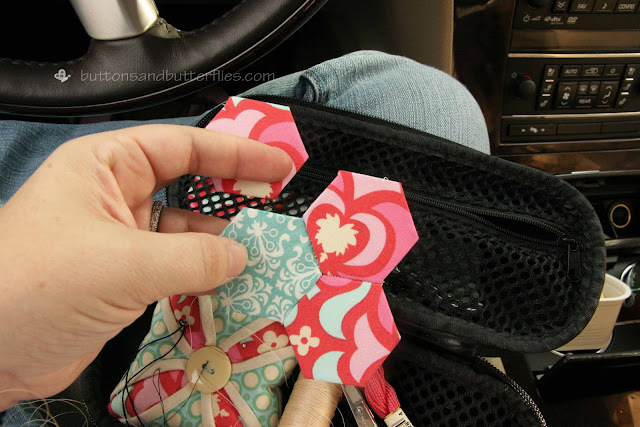 If you don't feel like doing the flower, just place them on your hoop fabric in a pleasing manner and embroider around each hexi with a coordinating color like this sweet pouch my friend, Sharon at Lilabelle Lane, made for me. The possibilities are endless with English paper piecing. Triangles, hexagons, squares. You name it! 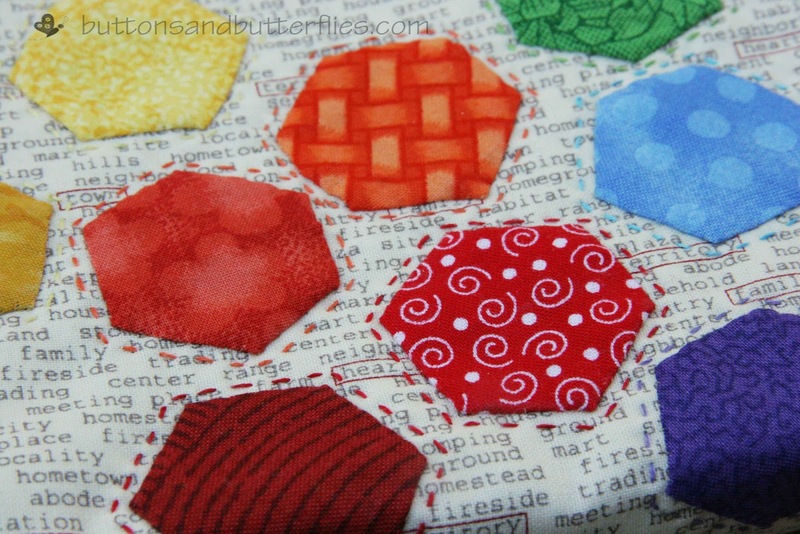 My favorite hexie project to date is my doll quilt set. 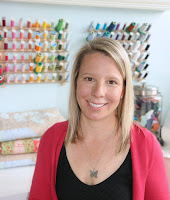 So if you aren't inspired to do a hoop project and want to start small? 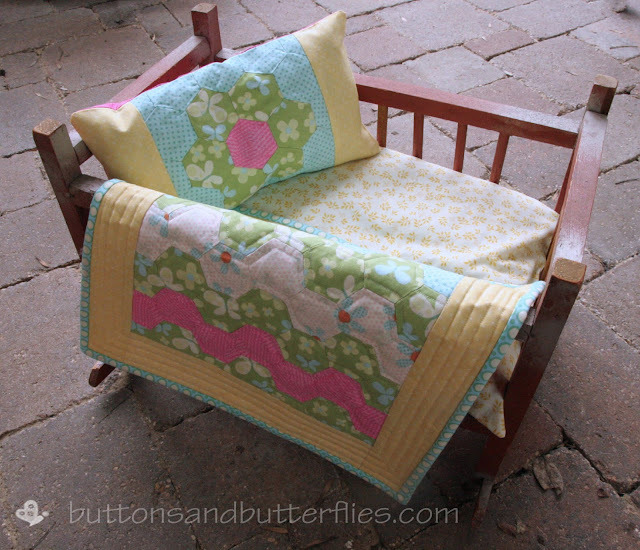 A doll quilt or wall hanging is are a great choice! I can't tell you how happy I am having handwork other than crosstitch makes me! I love it so much that I currently have a project that involves 600+. 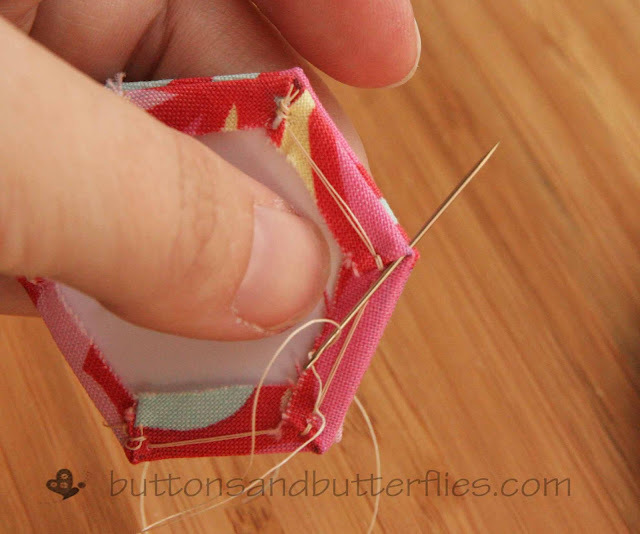 I need handwork desperately when I feel like I will never touch my sewing machine again. Sitting in the car for carpool line, watching tennis, and waiting for basketball practice to end. Not to mention a good sit in front of the TV with a loved one! I can't stand when my hands are idle! So join the madness with me!!! You inspire me! 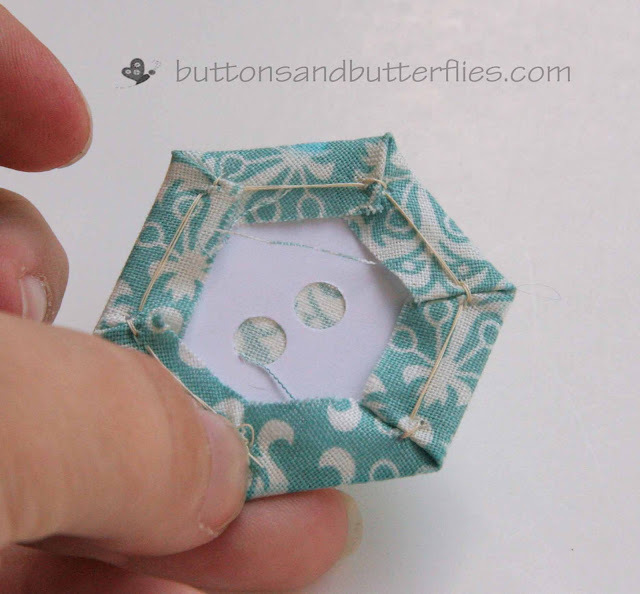 =) Thank you for the tutorial...I may just have to break out of my comfort zone and try this. Great tutorial... love it as a beginner. Oh how lovely to see your projects! Only found this via another site. The box of prepared hexagons made me think 'i could do that'. Thanks. 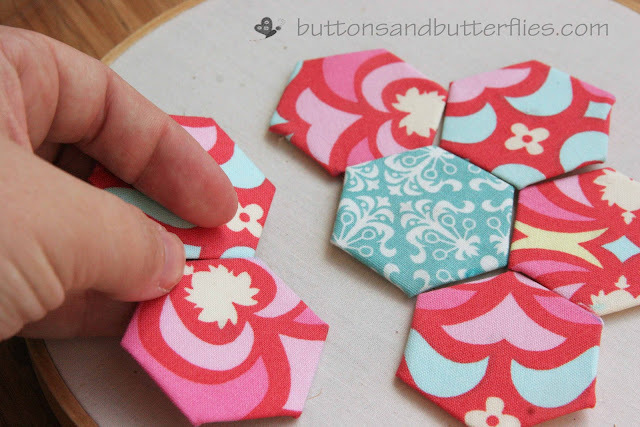 I watched Sue Daley's tutorial for English Paper Piecing. Instead of basting use a glue stick. I have a few friends that love glue basting. I, on the other hand, have a project that I used a glue stick on and it has started to become the LONGEST unfinished project ever. Not a fan. 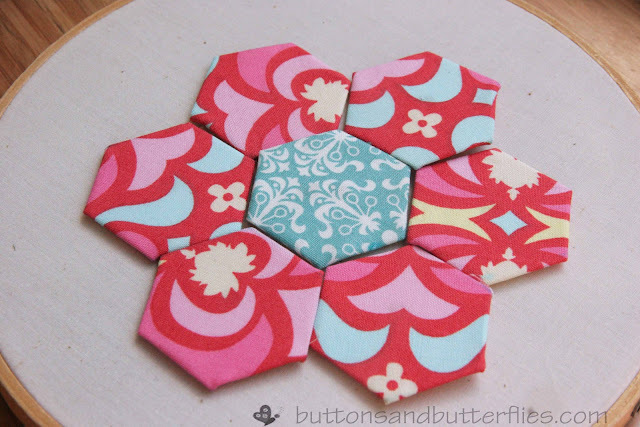 I am hooked on english paper piecing, only been doing a few weeks and got lots of flowers. 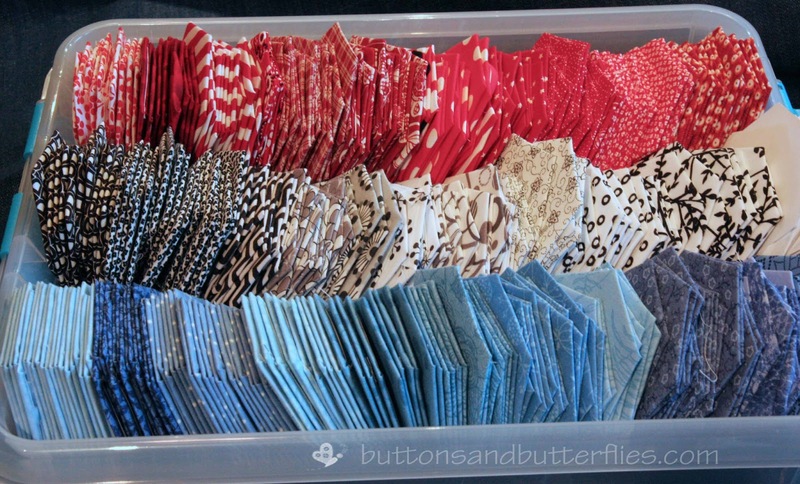 What projects aside from pillows/cushions and quilts can I make with them?